These dogs and puppies have been rescued from various pounds and shelters by volunteer foster carers who provide the dog with a safe haven until they can be permanently rehomed. Dogs are located throughout Sydney, Australia. Please note that descriptions of a dog's breed, age and size are given in good faith and are based on assessment of the dog's features, together with veterinary opinion. We cannot guarantee the age and breed of any dogs listed. All dogs listed come desexed, vaccinated, wormed, microchipped and over 6 months of age heartworm tested. Please note the age of each animal listed below updates daily. DCH is looking for volunteers to become foster carers for dogs in need. Can you open up your home and yard to a needy dog to help give them a second chance? Become a foster carer today. 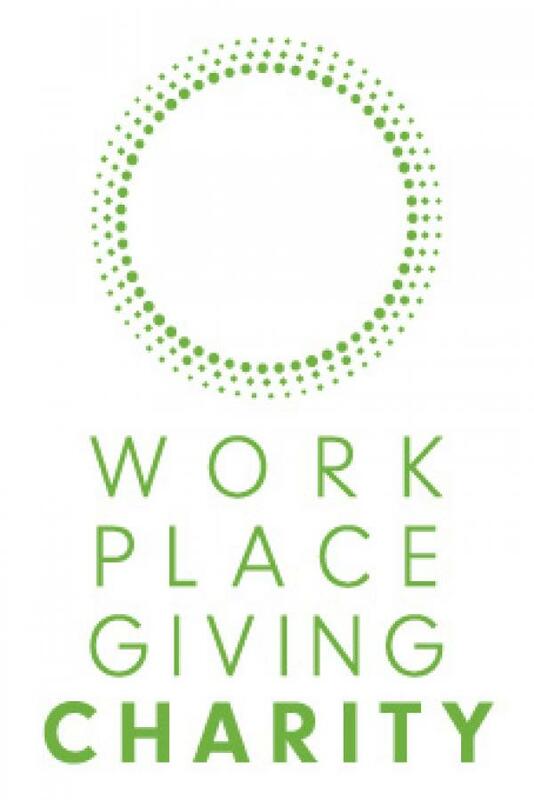 For more information on foster care and to apply for foster care, please click here. 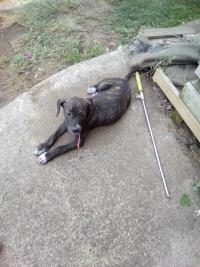 Dogs like this are needing help in NSW pounds now. Cassi is not only a beautiful looking girl but very well mannered and gentle in nature. She has a loving playful side to her that just makes her adorable to whoever she meets. Very well socialised (in care with two other dog see photo) and loves the company of all, rides well in the car, walks nicely on a lead and is great with children. Cassi is a medium/large sized dog. Exercising her with walks and leash free runs is part of her weekly routine. 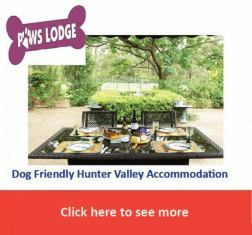 She is very obedient for the limited training she has had and will undoubtedly improve with your help and loving care. Cassi has been sleeping inside at night with no issues (toilet trained) once snuggled up in her spot she doesn't move, that could also be on you if invited . We are looking for an active, fun filled family or person’s environment for Cassi where she is accepted and loved for sweet personality and loving nature. There is one thing we must tell you about Cassi, she can jump fences with the ease of an Olympian. So your fencing will have to be colour bond at minimum as when you go out she will try to find a way to join you. Best to still have the high fencing. Cassi loves the company of other dogs but doesn't like sharing her food during feeding time, so if you have another dog best to feed them separately. Cassi was reluctantly returned to DCH due to her new owner needing to move overseas. During the 4 months with her new owner Cassi was put through a vigorous training program helping her to improve in her obedience. 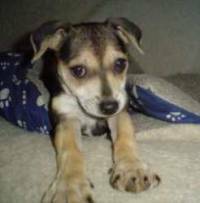 Cassi is vaccinated, de sexed and micro chipped and ready to go to a loving home. Adoption based on special conditions. Roo is a high energy dog who would do best going to someone with space for him to run around and with someone who is an experienced dog owner. I’d imagine he would make a great working dog if someone were to teach him the ropes as he loves to run and is very instinctual. Roo is an absolute goof-ball and provides endless giggles! He loves to play fetch tho is not very good an bringing things back and is always up for a game of tug (but watch your fingers!). He plays well will other dogs but can often be too rough and boisterous for the little ones. He is house trained and knows basic commands (sit, stay, leave it, lie down, shake, on your mat, come). He walks well on lead but sometimes jumps up and grabs the lead to play tug and it can be difficult to get him to stop. This ball of energy loves a cuddle and is extremely affectionate and loyal. He is also used to living inside with the family and quickly becomes your second shadow. Behaviour around other animals: OK with animals generally but can be to rough for smaller dogs. General Behavioural Issues: Gets over excited and can be nippy. Jumps on people to greet in particular children. Additional training should help. Bella and Jersey grew up together and share a very deep and special connection. They are very supportive of one another and a loving pair. They have different personalities that compliment each other. Both dogs are rather oblivious to other dogs, their socialising days are behind them. A "hello" sniff will suffice. They like bothering the cats, although, they'll never catch them! These two are very easy to look after as long as you give them love, attention and daily walks. They are smart and wise and a simple request will have them go to bed, finish their food or respect the house rules. They are house trained and will hold it until they are outside. 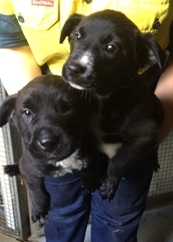 They have adapted really well and fast to their foster carer's home and never have been moody, upset nor unpleasant. Jersey (the ginger one) is the most active of the 2. She loves going for walks (with or without Bella) and is particularly caring. She will come check on all family members to make sure they are ok and obviously, get cuddles. She is not a big eater but enjoys treats and sits on command. Very good on the lead and gentle. She will bury her head in your elbow and make funny happiness noises when joyful! The vet was impressed with her health and general state: she does not look her age! She might have issues seeing well in the dark and is cautious of dark places such as building entrances or underground passages - but who isn't!!! Bella (the grey/white one) is in charge and her hip arthritis will not stop her chasing the cats! Although she has to take it easy and slow (very slow! ), she loves going for short walks and rolling herself in the grass! She enjoys a good meal... and needs to pay attention to her waistline! Bella's condition does not affect her personality. She is a loving dog, enjoying retirement and giving all the love she has. Bella and Jersey only want a little haven to enjoy their retirement together and be part of the family. Their adoption fee together is $250. If you'd like to meet these lovely old girls, please contact Jo on 0401 900 696‬. 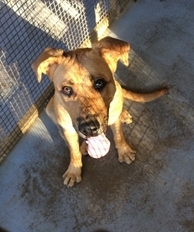 Cena is a young Mastiff cross who is just full of life. She is a typical puppy, wanting to play with everyone who is available, including dogs! She has recently been rescued from a regional pound, and so is enjoying all the love she can get with her new carer and the 4 dogs she is surrounded by. 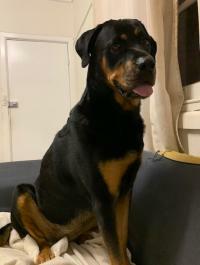 Whilst Cena is not yet vaccinated or desexed so can't be adopted, she is absolutely available to meet, so call her foster carer Rod to say hello! Introducing Nacho. A short little fella with funny-looking feet, big bright eyes and a heart full of love! Nacho is a 2 year old Dachshund cross Beagle Bitsa....Bits of this breed, and bits of that. 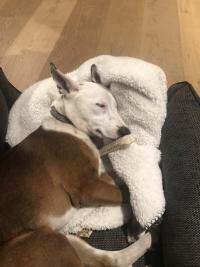 He is a lovely dog who has recently come into care as a skinny boy from a country pound after his previous owners weren't able to pick him up. It seems that Nacho was never taught what a ball was, or what a cat was, or how to socialise politely with other dogs. He walks really well on the lead, and thoroughly enjoys his daily walks with his foster carer. He seems to have decent recall, and is already starting to learn his name. At the dog park, Nacho sometimes gets excited and wants to join in on the fun with other dogs, but he hasn't been taught how to introduce himself to other dogs politely, and the best way to interact. So we are working on his socialisation skills. Nacho is very gentle when accepting treats from your hand, and absolutely LOVES couch snuggles. He will happily snooze by your feet on the bed overnight, however at his foster home we are teaching him to sleep on his dogbed on the floor. He has an easy-care coat, and an inquisitive and eager personality. He is also toilet-trained, and requires a home where he is allowed to be inside and part of the family. 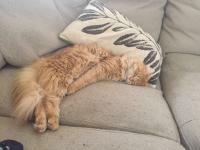 Since coming into care, Nacho has been vet checked, desexed, vaccinated, microchipped, de-flead and wormed. He's put on a healthy amount of weight since being with us, and is settling in well to home life, while he waits for his forever home. This gorgeous, friendly, girl has come into care with a severe flea allergy and extremely underweight. Thankfully, she has responded very well to treatment and foster care and her fur is almost all grown back..
Milo has been raised in a busy home with older children and is very friendly with all she meets, although she may have had bad experience with large men and can be scared by them or other things (like brooms). 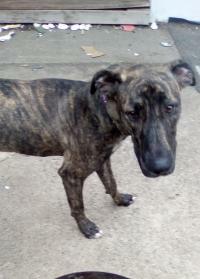 She has adapted to living with other dogs extremely well but has yet to be tested with cats. She seems to enjoy having canine company for the first time in her life. She is a smart girl and despite having very little training prior to coming into care she is picking up the rules of her foster home very quickly. She can now sit on command and walks well on the lead without pulling. She also was fine travelling (restrained) in the car. 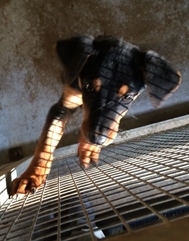 To ensure her ongoing training an experienced dog home would be best. She isn't as a large as a full labrador. 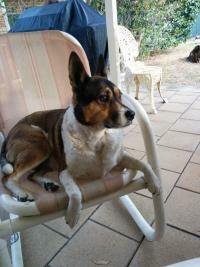 Milo is available for visits at her Glenhaven foster home. Please contact her carer to arrange a meet and greet. She is up to date with all her routine vet treatments, and will be de-sexed shortly. This beautiful girl has a lot of love to give. She has plenty of energy and very excitable. 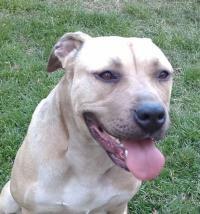 She will require an owner who is patience and willing to help with her ongoing training and socializing. She is in need of a new home due to changed living conditions and new work commitments and needs someone with patience & time. She has been owned by the owner since she was a puppy and has been with the 1 owner for nearly 6 years. 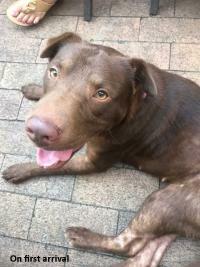 The owner maybe able to assist with travel to help rehome Emma. This stunning girl is Angel. She is a 4-year old female, desexed, Bull Arab X Staffy. Whilst Angel is good with other dogs when outside the house, when at home she can be dominant over other dogs due to competing for attention from the family, and so would likely be suited to a home where she gets to go out and socialise a lot, but is the only dog when home. Angel loves to play fetch, and is really great with people. She loves swimming, and has a clam shell in her yard that she loves to sit and play in. Angel is house-trained, but has had little accidents when very anxious. 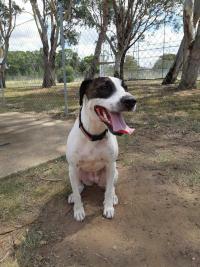 Please contact Gemma on 0435939858, who will place you in contact with Angel's current owner. URGENT - MUST GO - FOSTER CARER FALLING IN LOVE!!! This 8-10 month old gorgeous girl is Pepper. She has recently been rescued from a regional pound and has blown her carer away with how gentle, accepting and loving she is. 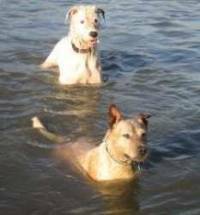 On her first day in Sydney, Pepper went to work with her carer and was so calm and obedient, that she hardly needed a lead to stay with him. She is currently living with 5 other dogs, and has been just as calm with all of them, as well as a couple of cats around the home too! Whilst she is going to be a tall girl, Pepper is not as muscly as the classic Bull Mastiff and so we think she may even be crossed with a Greyhound - this may explain why she is so extra placid!! She does not pull on the lead even though she is new to being on one, and whilst was a little confused about it at first, made sure to not pull her foster carer too much whilst she was working it out! Pepper is microchipped, and she will be receiving her first vaccination on Friday. She will also be desexed within the next coming weeks. Don't look past this gentle girl, she will be the perfect addition to any family and any household. Please call Rod, her carer, on the number below to organise a meet and cuddle with this darling.